When we're deciding on our next purchase we all have a "standard" in our heads that we compare the new candidates against. The ones that are close get serious consideration. The one we buy has the fewest trade-offs. A 250 mile range would be nice, spokes, the ability to go down a beaten path at walking speeds or cruise a hwy at 80 if needed. A low seat height for my 32" inseam so my feet are planted on the ground. Good wind protection, in a comfy upright position. An accurate fuel gauge and range meter with 2 trip meters. A motor that doesn't cook my legs in the summer. And as little vibrations as possible with a super light clutch. And a 360 dry weight so I can back it up with ease and pick it up if needed. And get 60+ mpg without trying. Also haul an extra 150-200 lbs if needed plus my 180lbs. Someday, someone will make this bike. There are bikes with a lot more power that are much lighter. Even without getting into exotic and more expensive materials there are easy ways to keep the weight way down. all the function of the bike. a lighter bike is going to save fuel too. you add a larger tank, a confy seat and some effective wind protection along with the proper gearing for dual sport. A 360-375lb twin wet is doable and it can be done with existing frame designs and engines, potentially cheaper. I guess it is ok to have a living room on wheels but then folks are going to miss a lot of fun and versatility. Ok but in the US and many other places that do not have that limitation why those 250s are not 350-450 engines? I know makers can push manufacturing but there is a lot of pull demand too. Why we don't pull for more versatile and durable engines? 250 have to be very tight, work very hard and still don't get there for many uses. 2 stroke in 250 will be ok but 2 stroke will perish unless they implement a new cleaner and more durable design specially for this type of application. I guess the point is Americans often seem to over-estimate how important their market is. In a global context, vs. Asia for instance, it's not that large especially in the smaller displacement categories. And, worse, small displacement bikes are really a niche market in the US, where the general attitude is "Bigger is Better." So there isn't a lot of incentive to add another model to the lineup if the manufacturer figures US demand can be mostly satisfied by the world 250 model. I just reread that and it looks like I'm trashing Americans. I sincerely apologize because that is not my intention. Fast Turtle, RedEX, neanderthal and 1 other person like this. A 250cc motor is hard to beat for back woods adventure. The power is all you need for slick conditions and they usually sip gas so they can get by with a smaller tank. They are usually lighter in weight and sometimes lower seat height. I had a 230l Honda with a six speed a 21 front and 18 rear. I could go for miles around 50-65 mph. Flogging the snot out of it in 6th. It didn't hurt its little motor one bit. And the torque off-road was just under the spinning your rear tire point. Tires lasted , chains lasted gas lasted. It served it's purpose and gave 100% at times. The bike was opened up and re-jetted plus one tooth on the counter. The short wheelbase made it squirrelly in deep gravel corners. I did pass a newer 250l in our main road with it at I think over 70. Never did bounce the Rev limiter. Its fun to flog smaller bikes sometimes. Mabey the U.S. Versys will become 250s and the 300 will be the big block. And no longer available in the limited edition Kawi Green with secret hop ups. Ever ! I always though, why the 250 is not a 299? ...just in case there is a type of physiological barrier at 300cc or something. Once you get off road the consumption is pretty arbitrary because one day one might go through easy terrain and the next the rear tire makes x10 times the distance of the front one. w/o putting them up into the red all the time. Many would agree the 2017 beta 390 is possibly the best (or at least one of the best) dual sport bikes ever devised and it is not a 250.
geared for long range travel. Something that can do 300 miles with a reasonable size factory tank is pretty attractive I think. I think I want a 400TR. Tinker07 and 11motos like this. That was a rolls royce compared to what I got! I bet I am older. 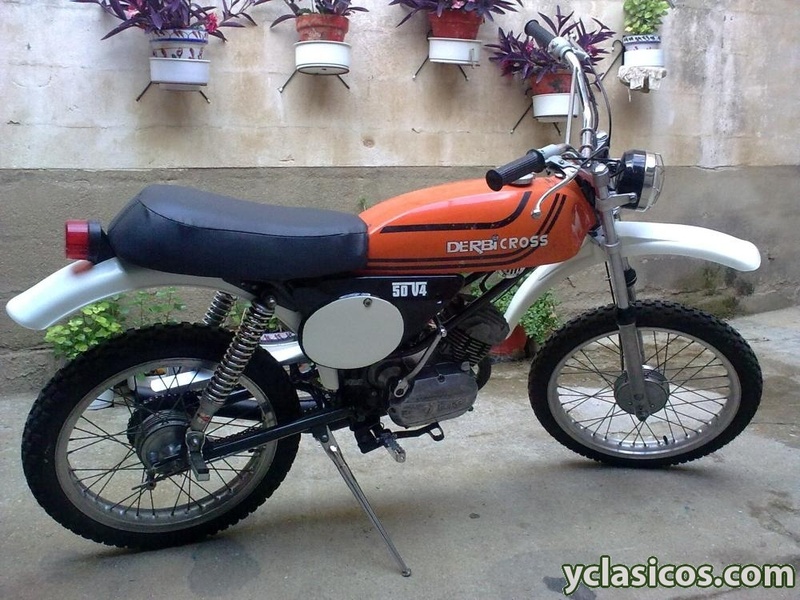 My first dirt bike was a Derbi Cross 49cc. that I later had rebored to 74cc. I got to find some pics in the old crusty family photo books. We didnt' have darn smart phones but had a lot more fun! And back on topic. Oops. None taken Ken, but....here is where the rest of the world does not get it. We are a big FREE country and can ride many many miles without papers (unless we break the law) and we have an incredibly diverse set of Geography. Still air, 80 mph air (wind), very very dry, very very wet, very very hot, very very cold very very low, very very high. This you see is what the "rest" of the world doesn't get. And one last thing, and its a strange thing, when the US pulls out things go to hell in a hand basket yet we are always told we are not that big of a part of the world market. Just sayin. One quick example. If the US stopped buying Chinese and stopped interacting with them they would have a complete revolution in less than 6 mths. You can disagree, but ask Mr. Xi first. I think many people will find the 300 appropriate for many uses in an affordable and reliable package. improvements from stock to make it better on and off road. be implemented in the next versions 300 or not. I would not have a problem ridding a 300 and will probably make some changes starting with tires and suspension tuning. I have a short list and if they bring a 400 with some of those then I would be pretty interested to make it my daily commute / quick get away... in comfort. If this segment grows, I am sure aftermarket will follow. The heavy KLR might be in danger unless it gets some long overdue upgrades. Based on your experience and aside from the engine speculation, is there anything you will change / tune for your use? Not trying to sound over the top but the general consensus on the suspension is it's one of the best non adjustable , front, preload in rear suspensions on a budget bike. 41mm forks are usually used on 5-600 lb bikes. It's not a drzs off road but a great canyon carver and totally acceptable to me off road when accepting it's limitations. You could put longer legs on it for more off road but I sold my drz so I would slow down in the woods. I just kills the drz on road and longer distance. Owning the drz made me realize how much fun you can have with 35-40 hp in a motor that will Rev all day long. But the drz runs out of breath on the upper end unlike the X.
I would use progressive springs and usually thicker fork oil in my bikes that needed it. Sometimes a fork brace as well. I will add the suspension starts off on the stiff side but mine had loosened up a bit. And most logging roads I can cruise 20-40 and it's pretty smooth. Real easy to stand up if you see a big bump coming. Only coming into a bumpy tight corner at 70 mph on road have I been able to upset it a bit. Riding faster than I should be. I don't push it hard off-road. I don't need another broken scapula and collapsed lung. Sorry to hear you had a bad crash once. I think 41mm is great. Doing some tuning to spring&rod forks is simple. It is not the factory settings that worries me but the amount of travel. How heavy are you and your average load? I'm around 180 lbs 200+ with gear, water, snacks ext. My gear is well armoured and heavy. I've had a bad crash more than once and paying for it now that I'm over 50. It was good to read they went with 41mm forks. It was also good to read that the stock suspension works surprisingly well. The 400 will most likely be just like the 300. $5,399 will go up to maybe $5,999. I'm predicting $5,499 to $5,799 for the Ninja. You can still ride in the USA on a 125cc if you want. The displacement is up to what your mission goals are, which are due to skill level, miles per day, flexibility, health, and gear load to name a few. Generally posting, the less time you have, the higher the displacement, the more time you have the lower the displacement. If the US stopped buying from China, no one would care about any revolution in 6 months because the economy and global economy would be ruined and a Global Great Depression would be impending.